I recommend that you stop reading this review at this point and watch David Karlak’s 2011 short film The Candidate (can be viewed HERE) before returning to this review and continuing on. I wouldn’t normally steer people away from reading my reviews but in this instance it would serve Karlak’s movie a grave injustice if you read this review and then went and watched the film. The Candidate is one of the best short films I have seen in a long time: the opening sequence alone – where we see the film’s main character, Burton Grunzer (played by Tom Gulager), dissect the faults of his work nemesis, Whitman Hayes (Thomas Duffy) – is beautifully crafted and draws you into the Twilight Zone-styled story for the full 20 minutes running time. It is best to see the film with as little knowledge of the film as possible. So stop now and see you back here in 20 minutes or so. The Candidate, based on a 1961 short story of the same name penned by American author Henry Slesar, centres around Grunzer, an underhanded company man, whose whole focus seems to be on his bumbling work colleague Hayes, his hatred for this man who – and this makes matters worse – seems to be being prepared by the company boss to succeed him to the top position. Things take on a sinister twist when Grunzer begins discussions with the shadowy organisation, the “Society For United Action” (SUA, in the form of an excellently sinister Robert Picardo). The SUA claims that they are able to kill anyone with the mere power of collective thought. Composer and music producer Zack Hemsey was asked by the director to provide the music. Although previously involved in non-film projects, Hemsey came to prominence when his track “Mind Heist” was used for the trailer of the 2010 blockbuster, Inception. Since then, his music has been used in numerous trailers including Robin Hood (2010), The Town (2010), Lincoln (2010) and 2 Guns (2013). Hemsey’s score to The Candidate is very much centred on the use of extended ostinato figures (and subtle variations) and succeeds in adding significant character depth to complement the polished visuals of the film itself. The score is dominated by rhythms and features strings (including harp) and percussion elements. Right from the outset, Hemsey uses rough, scratchy low string ostinato elements throughout the opening scene (“A Man’s Worth”) to add tension and a sense of unease as we watch Hayes (Grunzer’s “presentation partner/liability/Achilles heel”) abysmal attempt at setting up an important presentation in front of a group of execs. Grunzer’s own opinionated narration and his fuelled fuming hatred for Hayes is given a frantic and almost homicidal character when heard with Hemsey’s ostinato rhythms. Though I find the quality of the ostinato heard in The Candidate to be first-rate, when heard away from the visuals, sustained ostinato tracks can become tiring to listen to after a while. However, once knowing the music in context, with the movie playing in your head, Hemsey’s music conjures the juggernaut of Grunzer’s hatred for his colleague. This roughened strings ostinato figure recurs whenever Grunzer is left to stew in his own thoughts: when he’s left alone at the elevator after an unsuccessful corridor meeting with the boss where and that has been achieved is that his nemesis’ worth has been shoved in his face (“Star Quality”) or when the consequences dealing with the SUA become clear (“One Minute Over”). It’s a (seemingly) simple musical device but it’s used remarkably well to convey the inner workings of Grunzer’s mind. The centre-piece of the score is the five-and-a-half minute cue, “Informing The Target”, where the SUA representative, Carl Tucker (Picardo) sets out who the Society is and what it is they do. The force of this scene is carried both by the on-screen talents of the film-makers and the actors (particularly from Picardo) and Hemsey’s music. The score adds a sense of unease to the meeting with the use of long string lines and delicate pizzicato harp (this latter device having already been associated with the Society earlier in the score) and as the meeting unfolds and the function of the Society is revealed, dissonant chords are added. As Tucker’s “sales pitch” continues and Grunzer becomes drawn in deeper and deeper into the whole scenario, the low string ostinato reappears and image and music become one as a dossier full of successful previous “projects” is reviewed. Everything about the cue pulls the viewer along and into the drama, creating almost a frenzy that mirrors Grunzer’s entrapment by the end of the cue. Ostinato rhythms quickly reappear in the final track (“One Minute Over”), once again mimicking frenzy, but this time for completely different reasons. Although it is the various incarnations of the string ostinato that dominate the score, variation is provided by a more delicate harp motive (though again in an ostinato form) in “Society For United Action” and “A Vicious Queen” features low-end piano effects and hesitant string tremolos and is plays as a character piece for the company boss, Alexander (Vyto Ruginis). 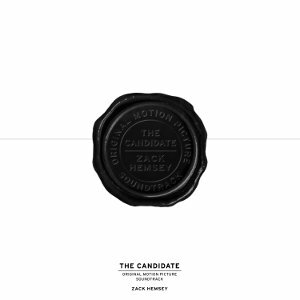 The Candidate is an excellent album, particularly for those who enjoy string ostinato-based scores and it will probably also appeal also to fans of trailer music (the latter half of “Informing The Target” does share some of the qualities heard in the trailer piece “Mind Heist”). But, those who take the time to watch this short film will have their listening experience enhanced markedly as the music will now evoke strongly the various set-piece scenes – and spark memories of the quality of the film itself. Hemsey’s music is more than just a series of varying ostinato cues. The disappearance/appearance of instruments and the limited inclusion of “stingers” in the score mark significant moments in the film itself: for example, the re-appearance of a string ostinato in “Star Quality” signals the appearance of Tucker in the film (Grunzer’s true nemesis?) and the inclusion of metallic effects in “A Man’s Worth” marks the moment Grunzer decides to come to the aid of his colleague in the opening presentation scene. Hemsey’s score is a huge asset to Karlak’s film, providing a strong indicator of the inner mind of the main characters. This allows the director to focus on driving the film’s narrative within the limits that a short film format sets. The Candidate can be purchased as a digital download in a variety of formats at the composer’s Bandcamp page. The tracks can be listened in full there too. I’m thrilled someone had the good sense to call attention to this album. It’s easily one of the best short film scores I’ve ever heard. Zack Hemsey is a tremendous talent. Thanks for this post. I just watched the short, and then I set about finding a place to download the music. Bought it at bandcamp:).